What if your organization could take advantage of emerging business opportunities by deploying new applications dramatically faster than you ever could before? What if you could increase the value of your existing application investments by leveraging them in the cloud—and easily move your apps across off-premises and on-premises cloud options? These capabilities are available today. 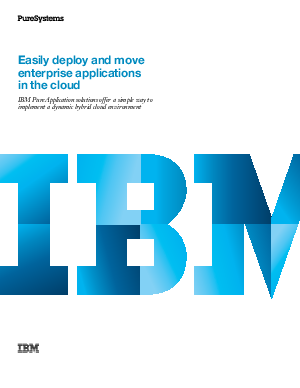 With IBM® PureApplication® solutions, companies can build and use a cloud environment faster, easier and with less risk than traditional methods to better engage with their customers and partners in new ways. The result: increased competitiveness and improved profitability in a changing business landscape. This paper describes a simpler way forward to gain these advantages.